I’ve been disappointed by a lot of the light roast coffees I’ve had in recent weeks. Many have been really lacking in the flavor department. 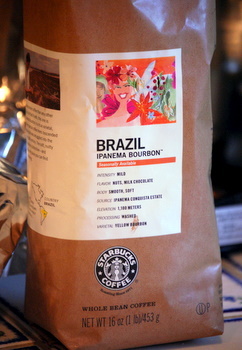 I can safely say that Starbucks’ Brazil Ipanema Bourbon coffee was not one of these. The light roast coffee – categorized as a mild by Starbucks – is packed with different flavors. It starts off really clean, with a subtle hazelnut taste. There are also some sweet and vaguely fruity notes, and a finish that is a little bit darker, with a hint cocoa or chocolate. It is not woodsy or overly roasty (i.e. burnt) tasting at all. It’s low acidity and is smooth and easy to drink from start to finish. This is a really nice coffee overall and should be popular with all kinds of coffee drinkers. Incidentally, the coffee is not not pronounced “BOUR-bon” like the liquor. Starbucks says, “Bourbon” (pronounced bur-BONE) refers to the specific variety of coffee plant from which these beans come. Arabica Bourbon is one of the world’s oldest and rarest species of coffee. The Bourbon tree is carefully nurtured to maturity, its prized cherries hand selected to ensure ripeness and peak flavor.